Well it looks like we'll be going to visit our friends in Sun City, SC every year in March while I have off from my job at the local community college for it's Spring Break. We drove there last year and combined it with visitng my brother in Roanoke. This year we flew and combined it with parts of FL. 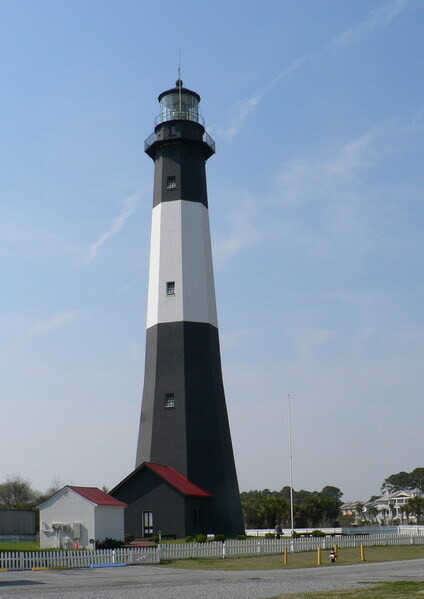 I did not expect to get to very many lighthouses on this trip- the only one I was counting on was the Hilton Head Rear Range. We had missed out last year because we left it to the last day and got to the gate of the community it's in too late to be let in. Esther and I spent our first day, Saturday, in SC going our seperate ways. She and our friends Phyllis and sherry went to tea and I went to the Rear Range lighthouse. I used the directions on the Lighthouse Friends website and they worked just perfectly. 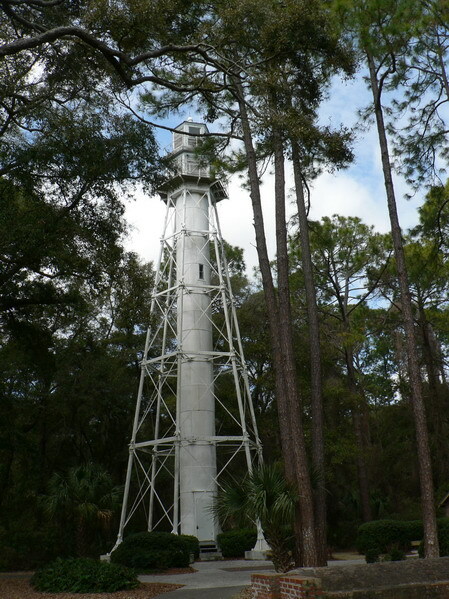 The lighthouse is on a golf course in the middle of a upscale housing area. 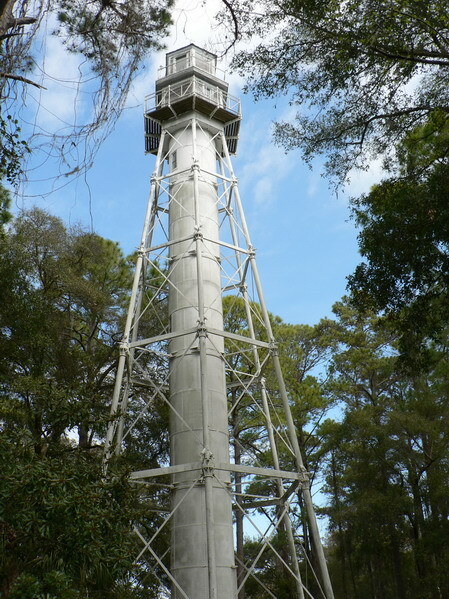 It's very difficult to get a clear shot of the whole lighthouse due to the trees that have grown up all around it. 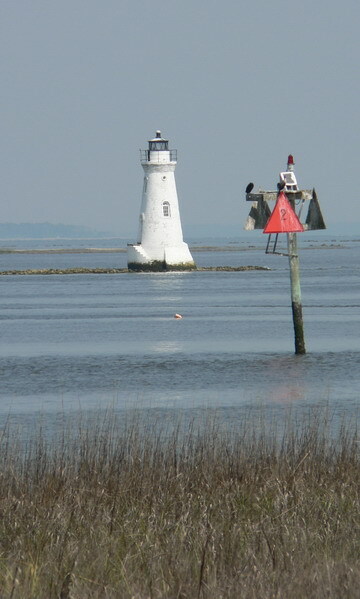 I decided since I was on Hilton Head I might as well drive down to Sea Pines and see the Harbourtown Light which was the catalyst that started me down the road to Wacko status. The light is open to climb but my knee has been bothering me so I opted to not climb it- or any other lights i went to that I could climb. I had climbed this one- and all the others I got to this trip that could be climbed - at some point in the past. I figured i'd just go to the gift shops on the ground and see the same things. 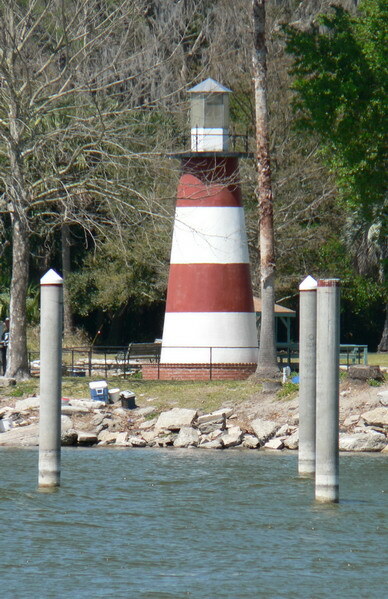 Here's a shot of Sea Pines Harbortown light. It looks like it could stand to be repainted shortly. Sunday was spent in the Charleston, SC area. Believe it or not our first stop - and most important for some - was the closest Dunkin donuts store to Sun City, SC. It's on the outskirts of charleston and we stopped for some coffee- and yeah we had some donuts as well. 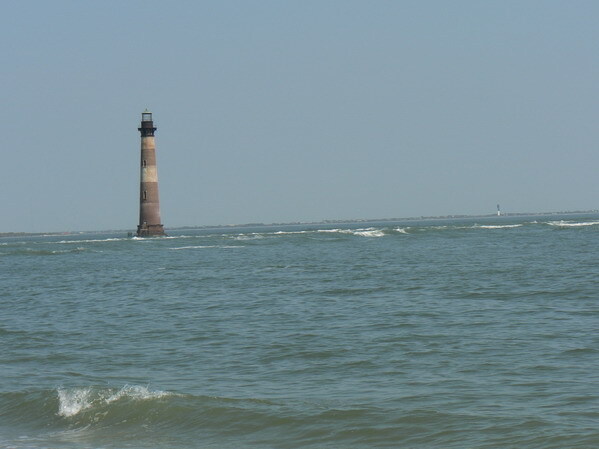 We were discussing what to do and since it was still before noon I suggested we drive down to folly Beach for Morris Island Lighthouse. 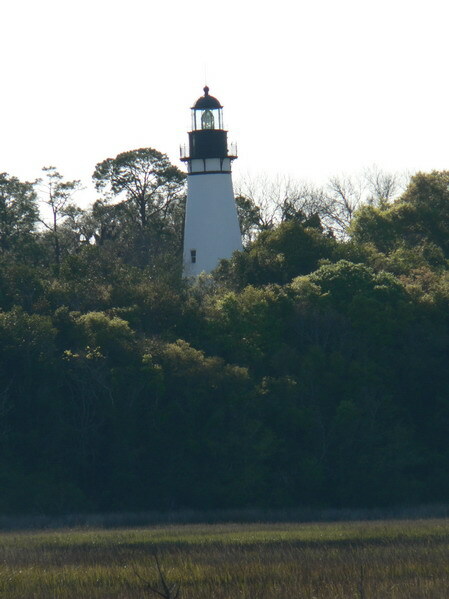 The people we were visiting with are not Lighthouse Wackos but they enjoyed the trip we took last year to hunting Island so I figured they would enjoy this one as well. They said sure let's go. We programmed the lady- what the crew took to calling the portable gps system I brought because it spoke with a woman's voice- and off we went. The weather was gorgeous- high 70's with very few clouds and medium humidity. 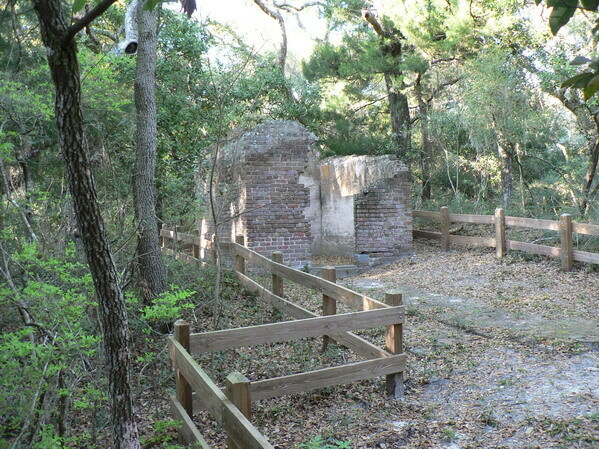 We continued past the foundations of the buildings that were part of the coast guard base that used to be here. You have paved right up to where the beach starts. 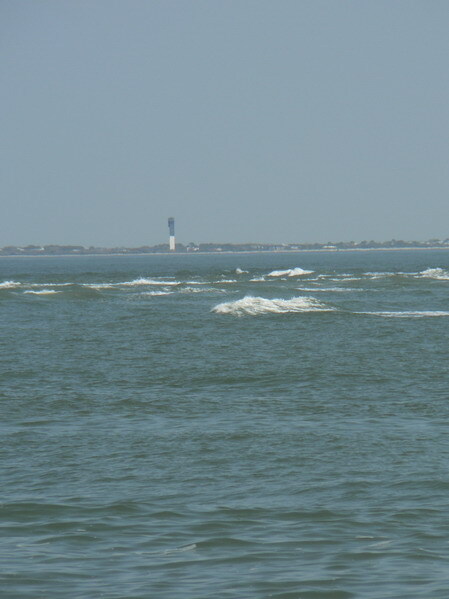 Here's some shots of Morris Island - as well as one of both Morris Island and Sullivan's Island (it's replacement) across the Charleston Harbor and one of just Sullivan's Island LH. We spent a good part of the afternoon here. We then took a drive down to the Battery in charlestown and then took our leave of charleston and drove back to Sun City. The next day Esther and I did different things again for part of the day- some of our friends had things to do for part of the day so I took Esther and Cathy (a visitor from Denver and the sister of one of our friends) to one of the local towns to shop at the crafty stores there. 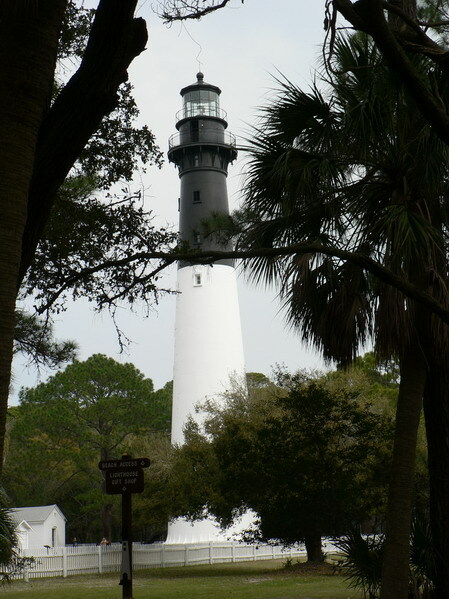 I chose to do a drop and run- over to Hunting Island LH while they did thier shopping. We had all been to Hunting Island last year so nobody minded missing it this time. 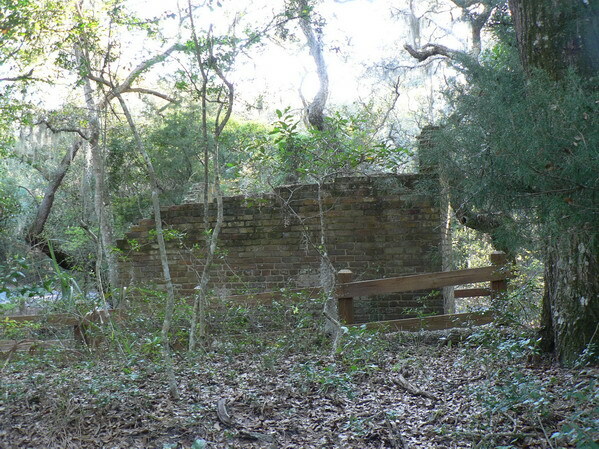 Here's a couple of shots of the Hunting Island LH. the first one is taken from the trail leading from the parking area. 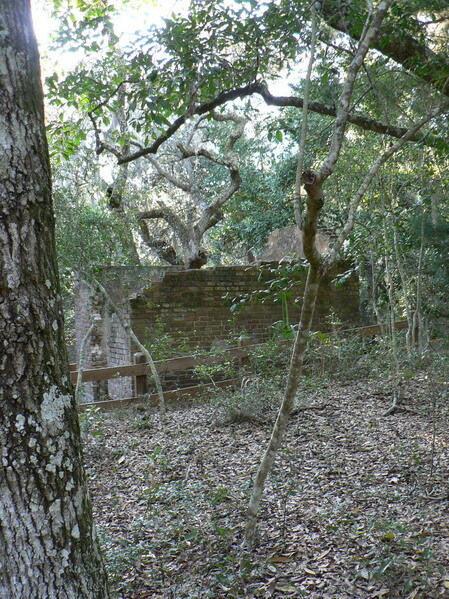 the second one includes the Oil house and another out building. Hunting Island State Park is very nice. 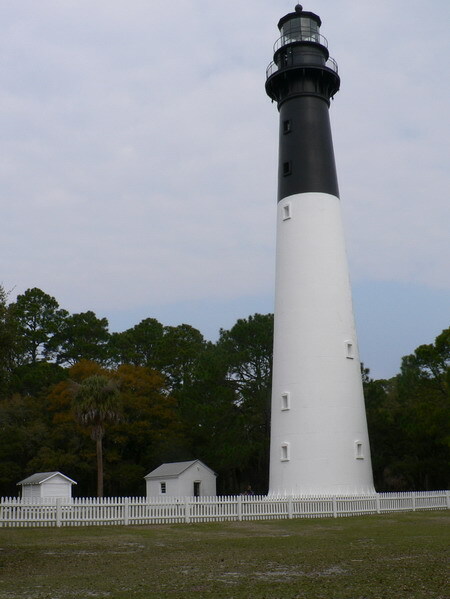 There is a great beach, camping areas, a fishing dock and the piece de resistance the Hunting Island LH. They've done a great job of restoring the light and the outbuildings. There's even a bonus in the base of the LH- the Fresnel Lens from Morris Island. I thought I had a photo of it from last year but I can't find it right now. The next day Esther, Sherry, Cathy and I drove over to Tybee Island. 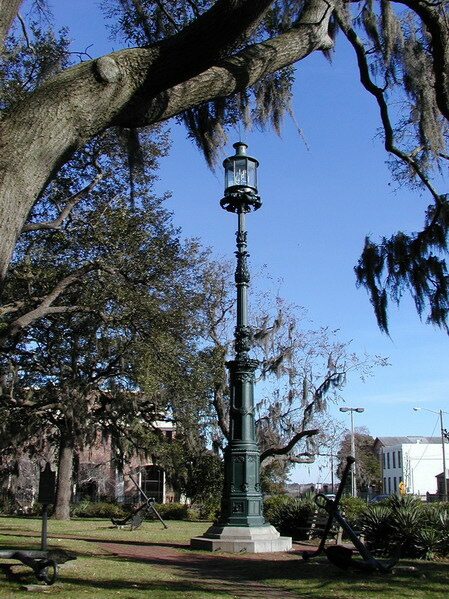 We had gone to Savannah last year so we didn't stop in town as we drove there. 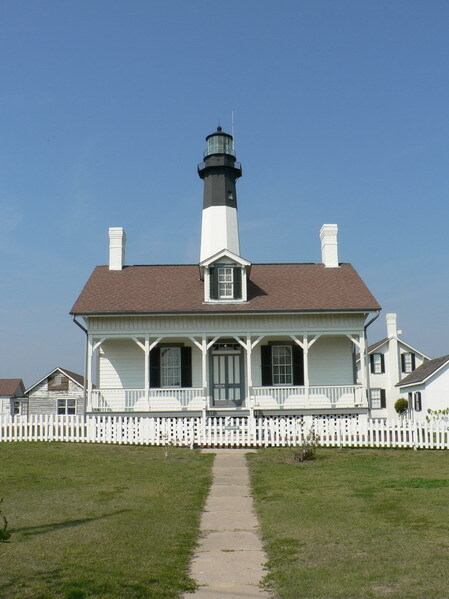 Unfortunately it was Tuesday and the Tybee Island LighthStation is closed on Tuesdays. This wasn't a big deal becaue we had all been to it before- still a small disapointment. Here's some photos I took while there. I like the effect of this first one. We took a walk on the beach here and I got several shots from that angle. i liked this one the best. We left there and I dropped the ladies off at some little shops (do we sense a pattern here? ) and drove over to take some photos of cockspur Island LH. There was a post on another lighthouse website that right after we were there that there was a ceremonial relighthing of the Cockspur Lighthouse. 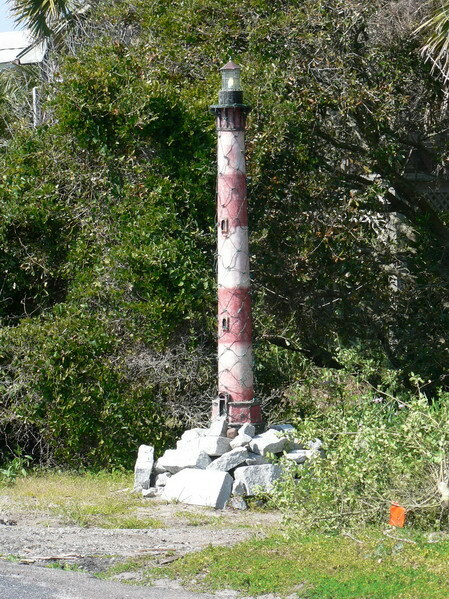 the photos were taken from a road leading to some docks on the Tybee Island side of the bridge . 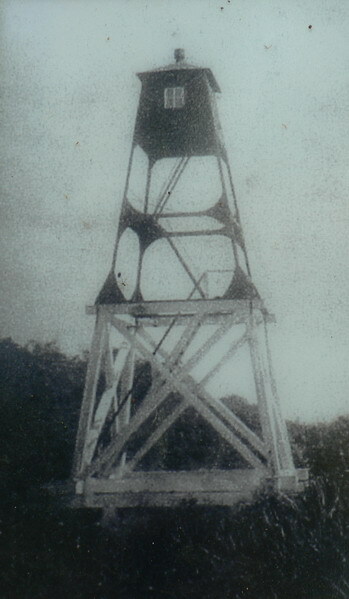 Here's a couple with what I believe may actually be the replacement for Cockspur Island Lighthouse. Please enlighten me if I'm mistaken. I went back and picked up the ladies and we drove on back to Sun City. We fly to FL the next day to spend some time with my aunt who lives in Englewood, FL. The morning we left there we drove down to Boca Grande, FL on our way to Orlando. 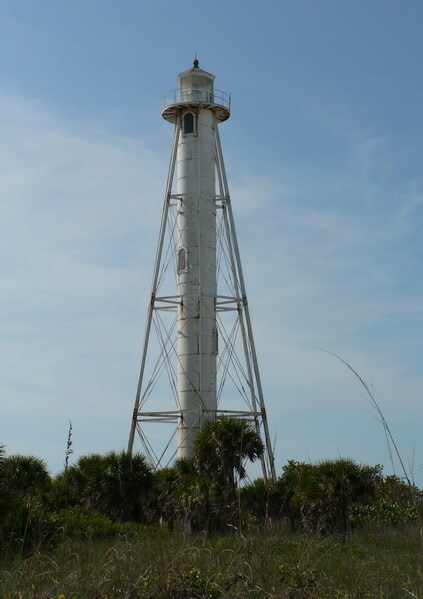 We stopped to take some photos of the Boca Grande Entrance Rear Range Light on our way to Boca Grande Lighthouse. 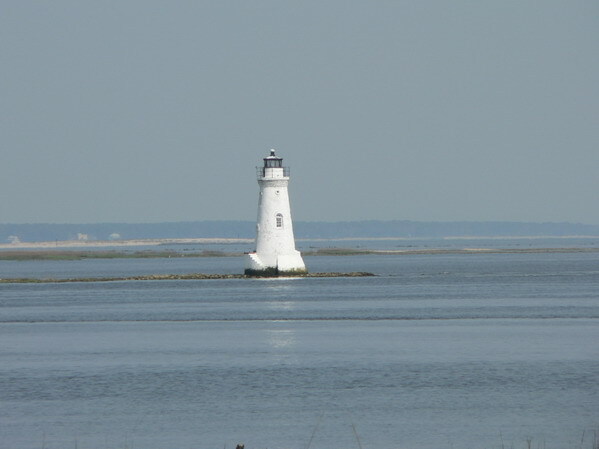 This light was built in Trenton, NJ (where I'm from) and was originally placed on Cape Henlopen, DE until 1918. 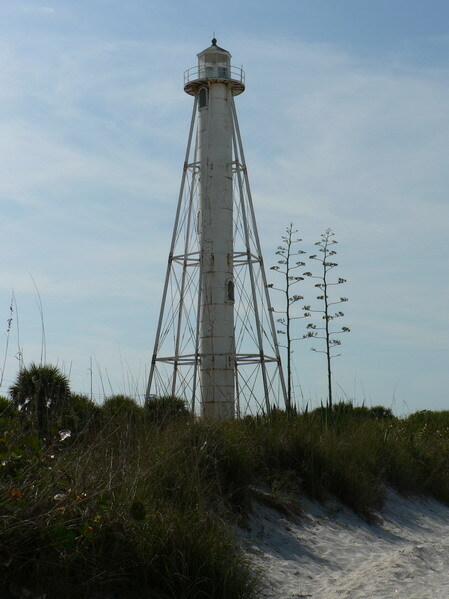 It arrived in FL in 1927 and was lit in 1931. 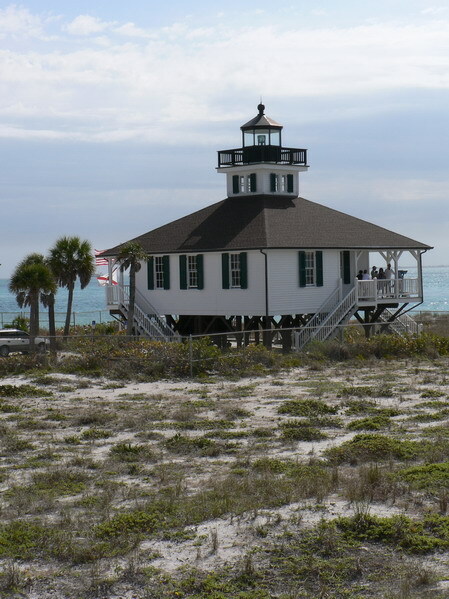 We continued on to the Port Boca Grande Lighthouse. I had a nice conversation with the lady who runs the place- again. the subject was the same thing we talked about several years ago- the fact that she couldn't get nay more of the replicas that HL made of the light. She remembered my previous explanation but still wanted more. I told her maybe HL would make a LLOM of the LH. We took our leave of Boca Grande and drove over to Orlando. We stayed here a couple of days- and actually got to spend more time than we usually do in NJ with our son, Douglas. He happened to be in Orlando on business and spent some time with us there. 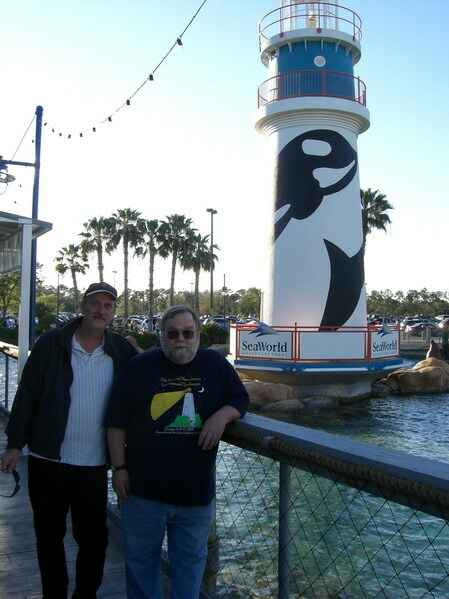 We spent Saturday at Sea World with a friend of mine who lives near Orlando- Doug. Douglas went to a trade show, though. We left Orlando on sunday morning and drove to Jacksonville, FL with a stop in Mount Dora, FL so Esther could do some more shopping and I'd get a chance to see the LH there again. I did manage to get a t-shirt with the Mount dora LH on it, though at the I "Heart" Mt Dora shop. 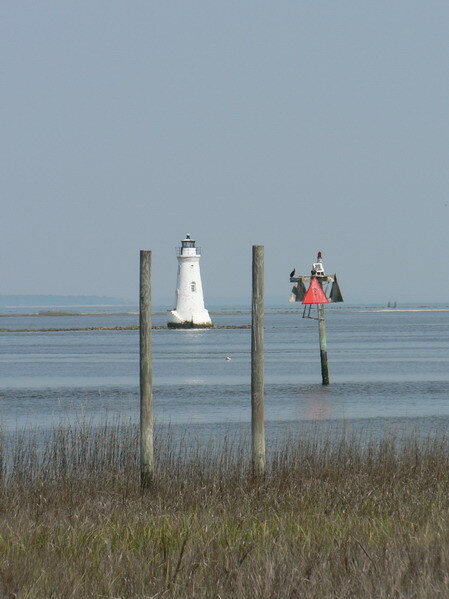 The LH is an actual aid to navigation for the Marina in the town on Lake Dora. It even has a "connection" to one of my other passions- Poco. 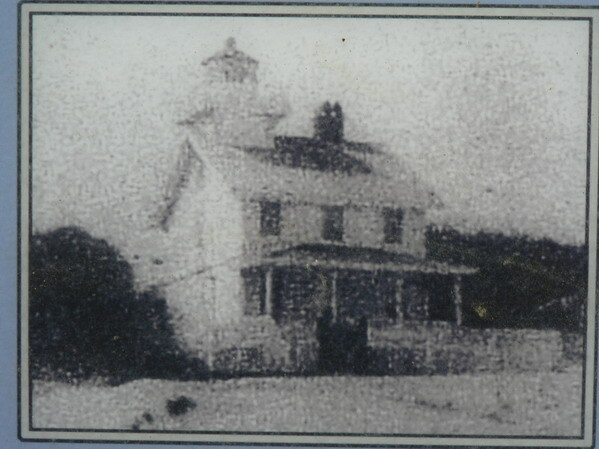 The LH is located on Grantham Point and the original drummer in Poco was George Grantham. I no of no actual connection between the two - it's just one of those strange little coincidences in life. Here's a shot of the LH. We continued on our way to Jacksonville. 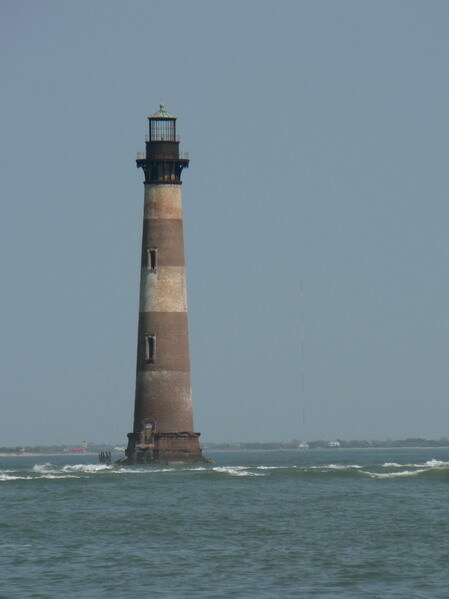 We drove right past Jacksonville and kept on going to Amelia Island to get a look at the lighthouse there. Unfortunately we got a bit lost- the directions on the Lighthouse Friends site say to get off at Exit 375 unfortunately it should read Exit 373. There is no Exit 375. No big deal- just a bit time consuming. 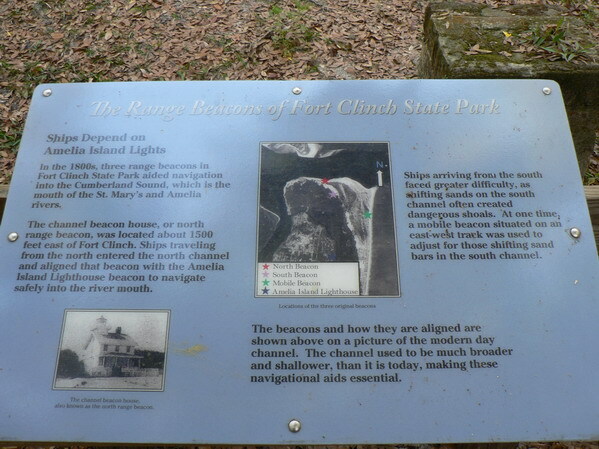 We drove on down to Ft Clinch State Park which is listed as the best place to view the light. This also has been refuted here on the forums- I didn't try and get closer to it because the site said access was problematic due to it being in an area with private homes. 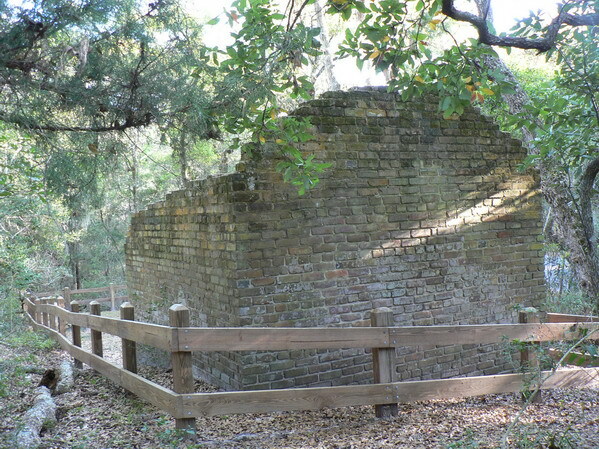 We drove further into the park because the sign at the spot where you can see Amelia Island Lighthouse speaks of the ruins of the Oil house of one of the other 3 beacons that served the area. We actually drove by it twice before we stopped at it- the signs for it aren't very good. 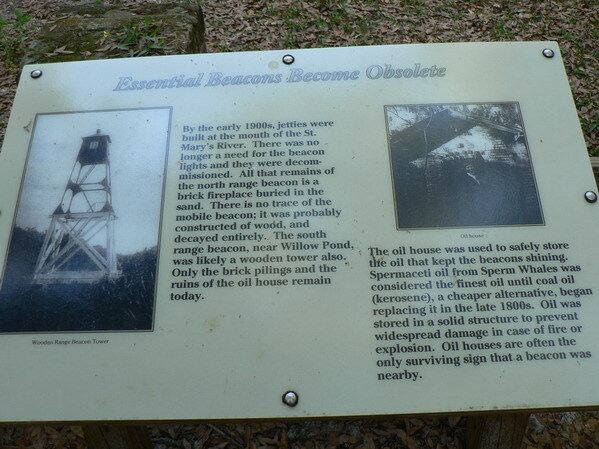 Here are some photos of the signs at the Oil House site. We left here and drove to our hotel and leftFL the next day. I didn't try and get to the other 2 LH's in the Jacksonville area because of comments made about the hassles of getting photos of them due to them being on base. All in all not a bad trip- good weather, good friends (and relatives) made for a nice time. 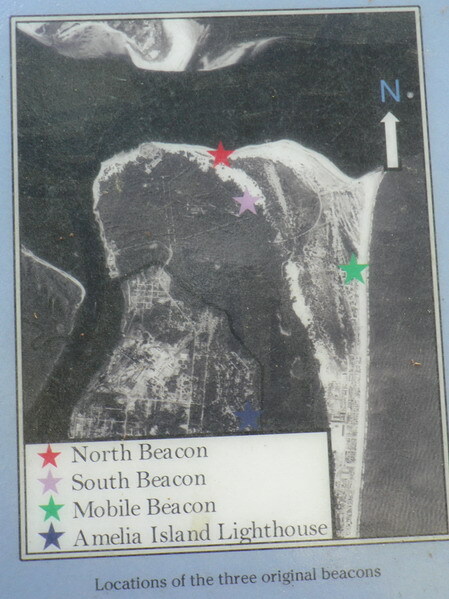 We got to more lighthouses than I expected- and added 2 new ones to my personal list and 3 if you count the ruins of the oils house and the outline of the beacon's spot. You certainly have been busy Dennis! Looks like a great spring break trip for you. Did they still have the painted turtles around Tybee Island? It was actually a relaxing trip- no rushing just got to where we got and didn't where we didn't. Yes, the painted turtles are still all around Tybee Island. 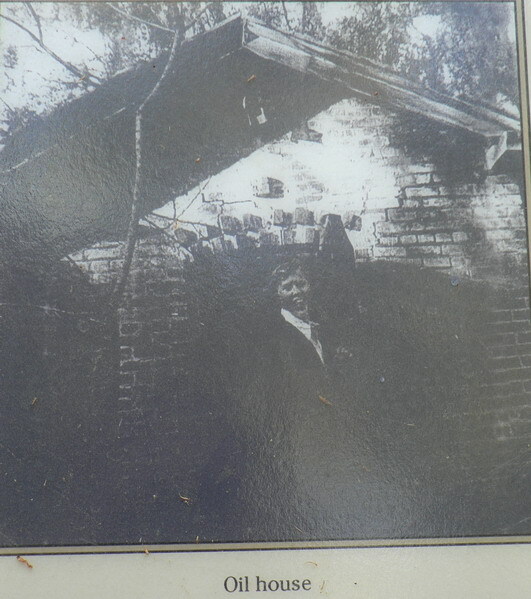 Cathy had her picture taken with the one in front of the visitor's Center on the main drag. Nice batch of photos, Dennis. I hope the weather in South Carolina stays as it was for your trip, because I'll be down there in a bit less than two weeks from now. My wife, Melissa, and I are first driving to western North Carolina to visit some friends of hers, then heading to the South Carolina coast for some lighthouse viewing (and photographing, of course). 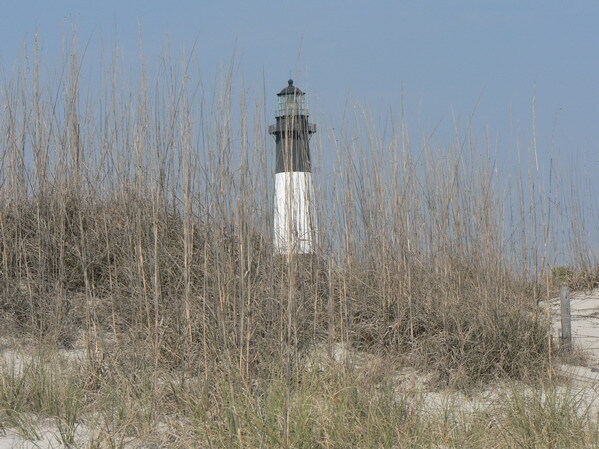 We're starting at Hunting Island, then going to the Charleston area, and then up the coast into North Carolina to see Baldy, Oak Island and Cape Lookout. We had great weather- in the high 70's and low 80's the whole trip with the exception of the last two days when it was in the high 60's . We had a bit of rain one day while driving from the Englewood area to Orlando. Hope you have a good trip- I'm going to get to the Outer Banks one of these years. NC is the only state on the East coast that I've not been to a LH. I'm going to pencil it in for next year's spring Break trip- again- and hope the plans don't change- again. You have a number of good shots there. I can imagine where you stood when you took many of those photos, for the ones I have visited at least. 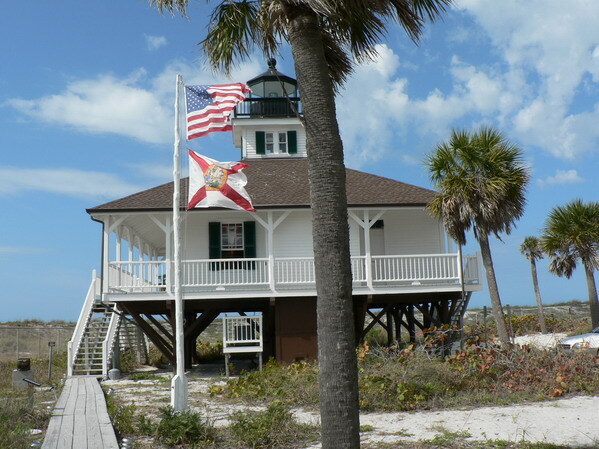 It looks like they have done a good bit of work on the Boca Grande lighthouse since we were there almost two years ago after Charley went through. Good to hear the lady was in a better mood than when we were there. Thanks for the kind words. 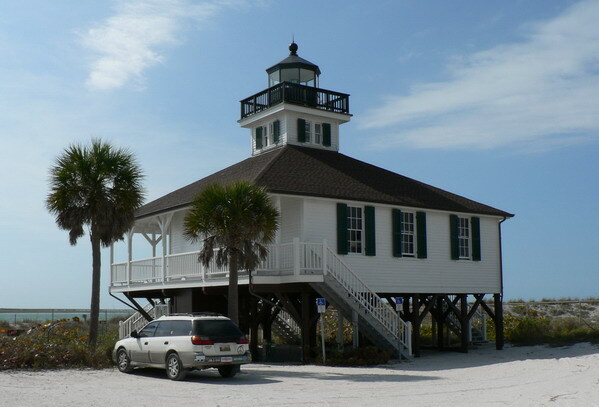 Yes, Boca Grande looks very good. I knew the island got hit a couple of years back by a huuricane- didn't remember which one, though. My Mother was living in my sister's condo at the - up the coast a few miles in englewood where they got almost no damage at all. The only complaint I heard was the same one I got 3 years ago- about HL and why she coulnd't get any more of the rplicas of the LH. I walked in with a LH t-shirt on and a camera and she said- Here comes another lighthouse nut. !